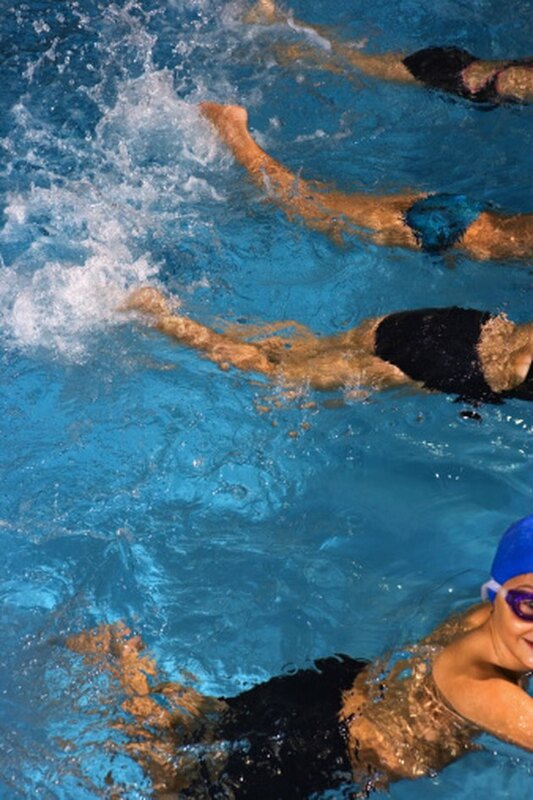 What Causes Leg Cramps While Swimming? A good muscle cramp can bring even the toughest hombre to his knees. When you get a muscle cramp, what happens is that the muscle suddenly and involuntarily contracts. Generally muscle cramps happen when you are dehydrated or have overexerted the muscle. When you exercise, like swimming, overexertion and dehydration is the name of the game. According to an article in Extreme Tri magazine, cramping while swimming is fairly common. They attribute the cramping to an inappropriate action of plantar flexing in your foot. Plantar flexing occurs when all the muscles of the leg form a rigid line from your calf all the way to the toes. It's an ideal position for the foot in that it allows the foot to maximize the water contacted, allowing for more speed. The problem is, holding this position is the chief cause of the cramp. There are three causes of cramping while swimming, and basically they are the same ones that cause cramping with most other sports and forms of exercise: electrolyte loss, conditioning and unnecessary tension. The most common of these when it comes to swimming is unnecessary tension. Unnecessary tension, like plantar flexing, is an involuntary action that is unnatural. The body will attempt to correct this unnatural position, causing a cramp. Having a muscle cramp while swimming presents some unique challenges to the sufferer. Generally, with most muscle cramps, the recommendation is that you immediately discontinue the activity that caused the cramp. You need to stretch and massage the muscle right away. When you're swimming, stopping the activity may not be an option since, if the water is deep, you could drown. The best course of action is to get out of the water as quickly as you can without causing the muscle to recramp. Once out of the water you can then go about stretching and massaging the affected area. Follow that up with a hot compress and later an ice pack. If muscle pain persists, take an anti-inflammatory to relieve the pain. Can You Swim Post ACL Surgery? Does Swimming Help Sore Muscles?